Three models are available giving outputs of 4 or 8 litres/hour single or 4 litres/hour double distilled water. The high quality PYREX borosilicate glassware coupled with silica sheathed heaters gives pyrogen free distillate of the highest purity from virtually any raw water supply. The unique condenser design ensures that the droplets of distilled water remain in contact with the cooling coil for the longest possible time ensuring maximum energy transfer. This produces cold distilled water ready for immediate use and pre-heats the boiler feed to increase efficiency. All glass construction allows rapid descaling using strong mineral acids. A built in "clean" function and integral acid addition funnel make the cleaning operation simple and safe with no need to dismantle any of the glassware. A large bore ROTAFLO stopcock with PTFE key is fitted for easy draining of chemicals after cleaning. A flow sensing device will detect any reduction in the flow of cooling water to below the required level and will turn off the still before it can overheat. Sensing the flow of cooling water rather than its pressure is safer and allows the still to run normally on low pressure supplies down to 3psi (20kPa). 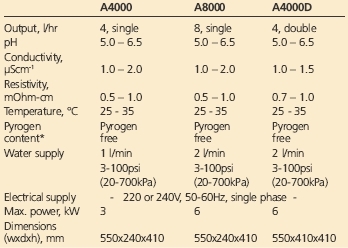 As a fail-safe device there is an overtemperature thermostat mounted in the boiling chamber. The Aquatron is very easy and safe to assemble and maintain. Both the acrylic safety screen and the cabinet lid are removable giving unrivalled access to the glassware components. Screwthreads are incorporated on all water connections so hoses can be fitted and removed easily and safely without risk of breakage. Every Aquatron water still is supplied with a reservoir level control. The control is a simple and effective system which can be fitted to virtually any type of reservoir vessel. It will turn the still off when the reservoir is full and restart it when the level in the reservoir drops as distilled water is removed for use making it fully automatic. Produces 4 litres/hour single distilled water. Can operate standing on the laboratory bench or be wall mounted. Supplied with easy to fit wall mounting bracket. 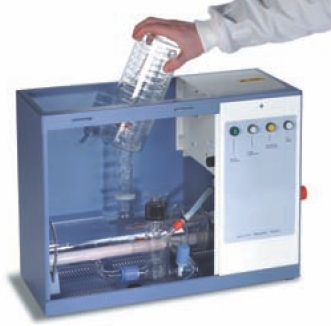 Produces 8 litres/hour single distilled water, ideal for the larger laboratory. 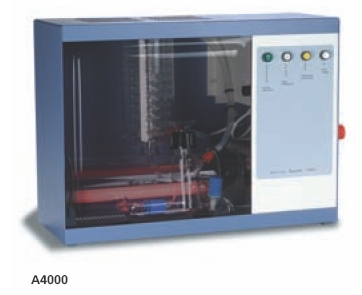 Glassware is enclosed in the same cabinet as the A4000 so can operate standing on the laboratory bench or be wall mounted. Supplied with easy to fit wall mounting bracket. Produces 4 litres/hour double distilled water for higher purity levels. The first stage distillation is carried out in a glassware set mounted at the front of the cabinet allowing easy access for descaling. The distilled water is fed to a second set of glassware mounted at the rear and distilled a second time. The rear glassware is fitted with a level sensor to ensure the heater is only activated when there is sufficient water in the boiler.